As Thanksgiving Day draws to a close here in the desert, I want to say an extra word of thanks to all of you who read this blog. It has been difficult lately to find the time to follow even my very favorite blogs. Or to keep up with comments on this one. And my posts have dropped to one or two per week. But for all that, I am tremendously grateful for all the encouragement and support I have gotten here in the blogosphere. A good deal of inspiration, wisdom, and invaluable advice have arrived via my laptop screen. My garden is certainly the better for it! So am I. So I wanted to say 'thank you' for once. 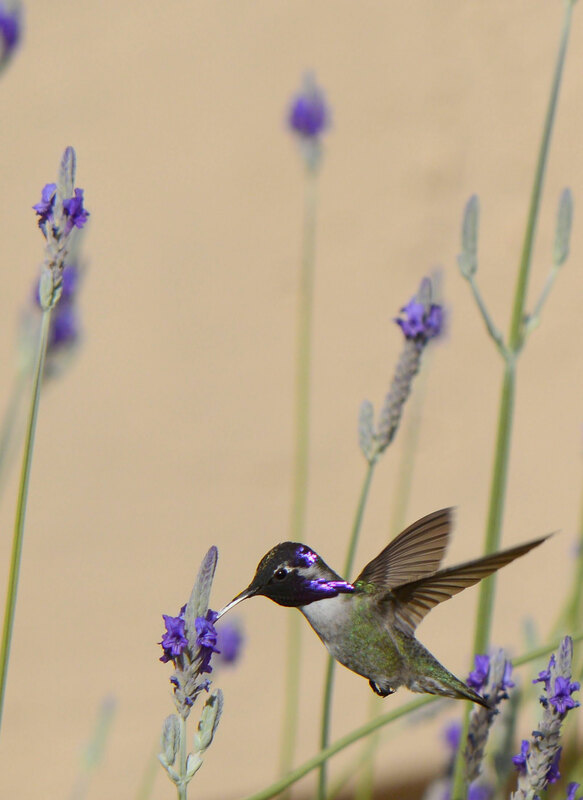 Also I wanted to share a few photos of Jewel, our resident Costa's Hummingbird. This winter he is proving less timid than he used to be and much more tolerant of the camera. 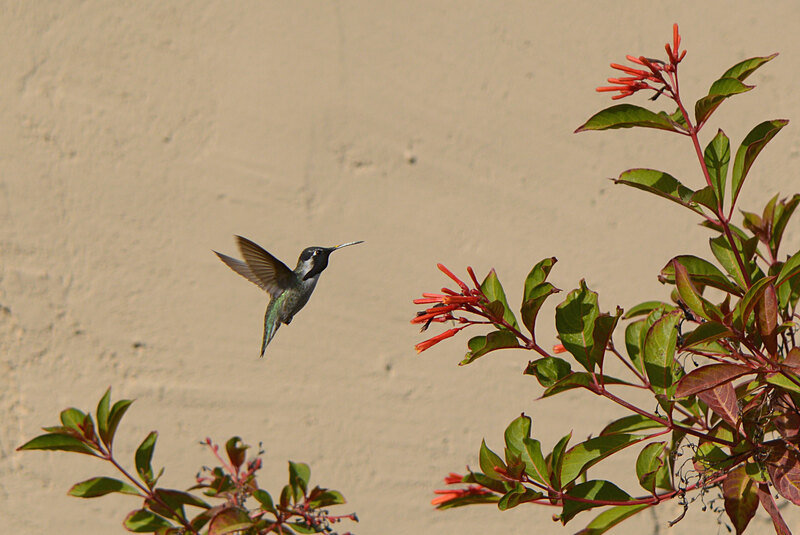 Does he know how magnificent he looks darting into the orange-scarlet flowers of Hamelia patens? Or, for that matter, hovering in among the Egyptian lavender flowers? Those are incredible photos, Amy. Jewel is one handsome bird! I hope you enjoyed the Thanksgiving holiday and and that the coming weekend is pleasant as well. He is beautiful Amy, and those are fabulous photos! Aren't they just amazing little creatures? I would love to see one some day, but there are none in our part of the world. Thanks go to you too Amy, for sharing lovely photos and tales of your desert garden. Seeing such a completely different gardening environment to mine is fascinating! Beautiful is the only word to describe him! Great that you were able to get close enough for that picture and sharing. That is the reward to us of the blogosphere. Kris, Prabhakara, Cathy, and Brian - Well, despite my remarks in the post, I did not expect to wait three days before replying to your comments! Computer issues have entered the mix (they are actually a big part of the problem anyway, thanks to our poor internet accessibility here in the 'outback'). Kris - It's lovely to have things slowing down a bit! ;-) Thank you on behalf of Jewel - he loves to be told how handsome he is! 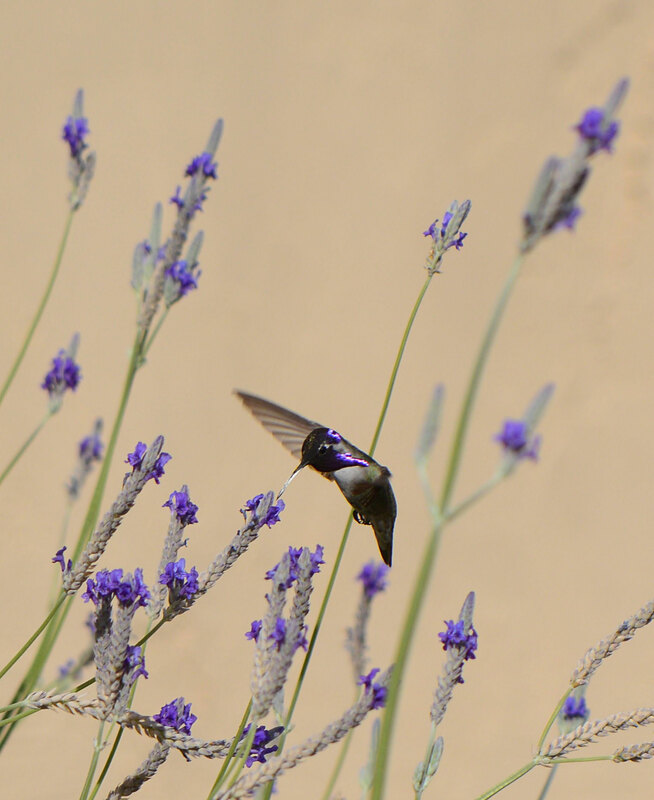 Cathy - Enjoying hummingbirds is definitely one of the perks of living out here. ;-) I hope you'll get to see some yourself, and of course you're always welcome here though the hummingbird presence is seasonal.